Spain has warned it will defend its interests as a row with Argentina over the nationalization of oil company YPF Repsol. Promising a “clear and overwhelming” response, the Spanish government summoned the Argentine ambassador to Madrid to express its concern. 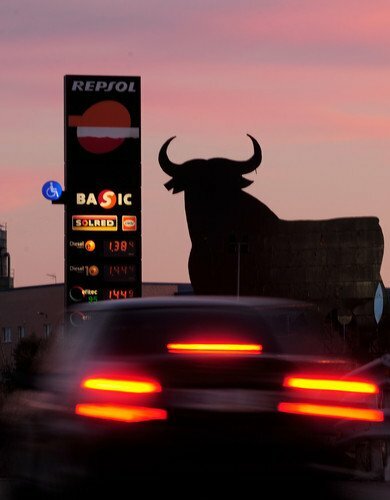 Repsol shares fell by 8% in early trading in Madrid and the firm has vowed to demand compensation. It said it would seek international arbitration over its 57% stake in YPF if necessary. “These acts will not remain unpunished,” Repsol executive chairman Antonio Brufau told reporters. According to AFP news agency, Repsol will seek compensation of at least $10 billion (7.7 billion Euros). Argentina’s ambassador to Madrid, Carlo Antonio Bettini, is due to arrive at the foreign ministry at midday. Earlier, Spanish Foreign Minister Jose Manuel Garcia-Margallo said the “climate of friendship” between the two countries had been broken. Spanish Prime Minister Mariano Rajoy is due to visit Mexico and Colombia, where he is expected to seek support for Madrid’s position. The nationalization was announced to applause on Monday at a meeting between Argentine President Cristina Fernandez Kirchner, her cabinet and provincial governors. Reading out a statement at the meeting, an official said YPF had been “declared a public utility and subject to expropriation of 51% of its assets”. Argentina wants to reduce its expensive energy imports from elsewhere. Before rumors surfaced several weeks ago that Argentina might take YPF from Repsol, Spain and Argentina generally enjoyed good political ties, and important economic ones. Spain does a significant amount of trade in the country, so there is likely to be an economic fallout to this dispute too. Antonio Brufau accused President Cristina Fernandez Kirchner of resorting to nationalization “as a way of hiding the economic and social crisis which Argentina is suffering”. Argentina’s crisis, he argued, was rooted in “a mistaken energy policy”. He accused Argentina of running a campaign of “harassment” in recent weeks in order to push down the price of YPF shares and get a bargain price for the expropriation. “It is not appropriate for a modern country, Argentina does not deserve this,” he said. Repsol’s Argentine partner, the Eskenazi family’s Grupo Petersen, has a 25.5% stake in YPF which will not be affected by the nationalization. However, Reuters notes that it is unclear how Petersen will be able to repay a $1.9 billion loan provided by Repsol.